"The Daleks will reward failure on your part with elimination!" 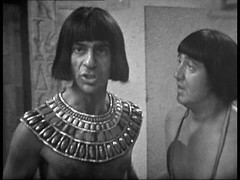 I'm surprised we've not done ancient Egypt before on Doctor Who as it's such an obvious choice. The Hartnell/Monk and Monk/Chen scenes are superb, but I suspect the rest may have been better with the pictures..... Fortunately we can get an idea what it all looks like by watching the next episode which does exist and shows us many of the characters and the superb sets. That episode also contains a small fraction of this episode, the end where Steven & Sara discover the hand emerging. 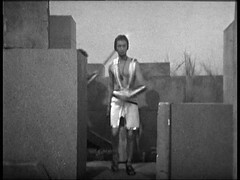 We'll be back to ancient Egypt for the Pyramids of Mars when we play up to the Mummy stereotype a little more, but the Mummy's tomb theme is used before then in Tomb of The Cybermen. 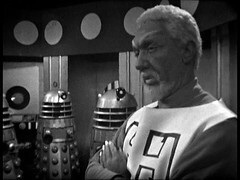 Camfield favourite Walter Randall, on the right, makes his third Doctor Who appearance as the Egyptian warrior Hyskos. He was previously Tonila episodes 2-4, The Warriors of Death, The Bride of Sacrifice & The Day of Darkness of The Aztecs before director Douglas Camfield used him as El Akir in all 4 episodes of The Crusades. He returns as a Patrolman in The Invasion Episode 1 (director: D Camfield), Harry Slocum in Inferno Episodes 1 & 2 (yup you guessed who directed this) and as the Guard Captain Planet of the Spiders: Parts Three to Five (NOT directed by Camfield!) There's also a rare speaking part for Derek Ware as Tuthmos, seen to the right of the leftmost picture which also shows Jeffrey Isaac as Khepren. 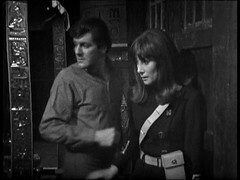 Ware is the fight arranger for many Doctor Who stories including the very first, An Unearthly Child, which Camfield was working on as an AFM. Camfield used him as the fight arranger on the Crusade and as a bus conductor in the short segment of the Chase that he directed and he'll reuse him for Web of Fear and Inferno. He'll later appear as Rozzer in The Italian Job and found the stunt agency HAVOC used on many 70s Doctor Who stories. He's not the last actor from The Italian Job that Camfield will cast in Doctor Who either! There's plenty of extras used as Egyptians in this and the next episode and many of them have prior or future form in Doctor Who! Prominent amongst them is Dave Anderson playing as Egyptian Warrior. He's been a Caravan Warrior in Rider from Shang-Tu and a Palace Guard in Assassin at Peking, the fifth and seventh episodes of Marco Polo, which Camfield also AFM'd. He was then the Aztec Captain in all four episodes of the Aztecs before appearing as Reynier de Marun in The Lion, the first episode of the Camfield directed Crusade and the then as Sven in The Time Meddler, also Camfield directed! Since this is his last Doctor who appearance it's worth mentioning that his later career included roles in two prominent British films: as Gregory's Dad in Gregory's Girl and as Fraser in Local Hero, both directed by Bill Forsyth. This last film gives him a rare distinction: he's one of the few people to have worked with both William Hartnell, the first Doctor, and Peter Capaldi, the current Doctor! (There's another in this very episode!) David Brewster is another Egyptian Warrior with Marco Polo & The Crusade on his CV: he was a Mongol Bandit in Rider from Shang-Tu, episode 5 of the first story, and a Turkish Bandit in episode 3, The Wheel of Fortune, of the second. Similarly Valentino Musetti was also a Mongol Bandit in Rider from Shang-Tu and appeared in The Lion as a Saracen Warrior. He's back as Prisoners in The Mind of Evil Episode One, Three and Four, and extra in Colony in Space Episode One and an extra in The Time Monster: Episode One. 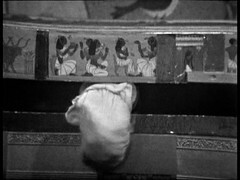 Musetti and Anthony Lang, Egyptian Slave, are surprisingly the only two extras to appear in both this episode and the next. This is Lang's first Doctor Who appearance but he'll be back as an Extra in The Highlanders Episode 1, one of the Airport Personnel on Plane in The Faceless Ones Episode 1, a Time Lord in The Three Doctors Episode One and a Kaled Councillor in Genesis of the Daleks Parts One & Three. IMDB thinks he's also BoShek, the spacer wearing the black Tenth Planet spacesuit in the cantina in Star Wars but other sources disagree, He does however play the Emperor's Advisor Slim Aloo in Return of the Jedi. Another Egyptian Warrior has a lengthy involvement with the program: John Caesar has already been the 2nd Man in Market in The Romans 1: All Roads Lead to Rome (1965). He'll return as Monoid Four in The Ark episode 4: The Bomb, a Cowboy in all 4 episodes of the Gunfighters, a guard in all four episodes on The Macra Terror, a Pirate in episodes 1, 3 & 4 of The Space Pirates, C.P.O. Myers in The Sea Devils Episode Six and the R / T Soldier in Invasion of the Dinosaurs Part One (1974). Kevin Leslie was a.so in the Gunfighters appearing as a Lynch mob member in episode 2, Don't Shoot the Pianist, and episode 3, Johnny Ringo. Terry Leigh was a sailor in Flight Through Eternity, episode 3 of The Chase while Gerry Videl was Beaus in episode 2 of this story, Day of Armageddon. Eric Mills returns in Priest of Death, the third episode of the next story The Massacre as a Parisian Man while occasional stuntman Rocky Taylor is also a guard in The Curse of Peladon Episode Four as well as performing stunts in the Blake's 7 episodes Hostage & Countdown. 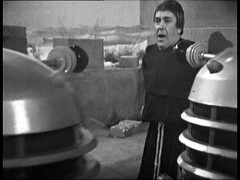 Bruno Castagnoli was a Dalek operator in Dr. Who and the Daleks, the first film which featured two of the Dalek regulars from this story. Finally the name of one of the actors playing an Egyptian Slave sprang out at me: Lew Russell is the given name of circus owner Luigi Rossini in Terror of the Autons!